When there’s a set routine in doing things, children feel secure that they know what’s going to happen next, and are less likely to offer resistance. When they do offer resistance, you refer them back to the routine. Lately, during diaper change time, Dahon would always insist on wearing red diapers. As in insist. Teetering on the edge of a tantrum insist. We don’t have a lot of red in our limited cloth diaper stash, so of course at some point the red ones would all end up in the wash. Instead of just imposing and saying, “no you can’t wear red diapers, wear this instead!” we’d let her pick another color, or hold up two diapers and ask her to choose which one she’d like. Her attention would instantly be diverted from her impending tantrum to deliberating on our question, and she’d pick a diaper without further complaint. Curiosity Questions: Asking versus telling. I admit, I say things like “iligpit niyo na yung toys niyo, iligpit niyo na!” (“Put away your toys, put them away now!”) all the time, but when the twins refuse to obey, I’d change tactic and frame it as a question instead, something like: “Your toys are on the floor. Where do we put our toys?” And they’d think about it and then point to the shelves, and then go put the toys away. There are times when they’d just flat out ignore me and I’d simply have no energy to go about it properly, though. Also, when they’re with the yaya, she’d just be the one to pick up the toys. Obviously we still have to work on the consistency. I find this important when the twins are testing boundaries or are trying to break established rules. They know that brushing their teeth is not negotiable, so even if they don’t want to brush, I try to firmly but kindly make them understand that brushing will happen no matter what. I say try, because, well, my patience runs out sometimes, and then there’d be more of the firm and less of the kind! Yikes. Follow through: If you say it, mean it; if you mean it, do it. This is sort of connected to “Be kind and firm.” For example, the twins love playing with split peas. We keep a small bag’s worth of split peas in a container and when the twins want to play, we’d spread a table cloth on the floor, bring out some plastic spoons and cups, and let the twins have fun scooping up the peas and pouring them out. However, for my own sanity (and so we won’t have to buy split peas every week), I’ve established a rule that the peas shouldn’t be scattered on the floor but just stay within the table cloth or else the peas will be taken away. And I do take them away. So they behave. And negotiate, ha ha, when some peas get scattered and I make a move to pack everything away. This is technically not part of positive discipline tools, but I’m mentioning it here because I think it’s part of being respectful of our children as individuals and not just as little people to be ordered around. When the twins are digging their heels in about something, I take a deep breath, remember to be firm and kind, and wait. I wait while they play a couple of minutes more in the bath. I wait while they struggle to do something by themselves, like open the door or put the lid back on something. I wait while they go pick up a particular toy because they just had to do that before they’re ready to go downstairs. Things seemingly take a little longer, but I know that they’d take even longer if I swoop in just to get things over with. I have done that, I still do that when I lose patience, and the results are just tears and much flailing about so, yes, I’m working on it. All in all, the positive discipline workshop gave me a lot to think about and work on. The way it was conducted was also quite helpful. Small group size. We were 10 participants in the class, just the right size for healthy interaction. I learned a lot not only from the resource person but also from my fellow participants. Lots of role-playing. Role-playing is a little uncomfortable for shy introverts like me, but they were very helpful because I was really able to put myself in the situation. I was reacting and interacting in real time, with results that were more genuine than if we were just sitting there discussing the hypothetical situation. One full day. A two or three hour lecture would just be covering the basics, and two days or more would be unrealistic for busy parents, but one day is doable and allows for more extensive learning and opportunities for interaction. The workshop was a trial run offered by Clarice Anne Aviñante. 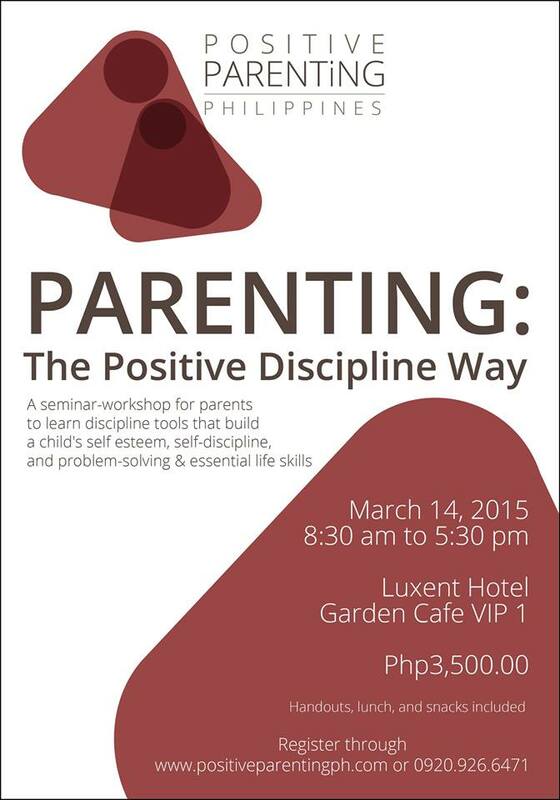 The first official run of the workshop is scheduled for tomorrow, March 14, so I think the slots are probably full by now, but you can head over to the Positive Parenting Philippines Facebook page for updates on future workshops or simply tips and reminders on positive parenting. Awesome good read! Disciplining a child is really hard, especially if you have a strong-willed kiddo. And most of the time, my mommy boo-boo, i catch myself failing to mean what I say. But oh well, there’s grace in everything. 🙂 thank you for sharing. we definitely need lots of grace! everyday, ha ha! I have a 10 year old sister, and since my mom died last year I am the one who’s already in charge of disciplining her. There are times that I forget that she’s still young and sometimes, I become too impatient because she is so makulit and being pasaway. Your post is really helpful and would help me how to discipline her the right way. I imagine that’s a very tricky situation, balancing between being a sister-friend and guardian-disciplinarian. So even more important, I think, to really improve the relationship and strengthen the bond between you. Hugs and prayers for you! Naku I have to print this out. There are so many things to learn, so little time! Children grow up too fast! This post is very essential in parenting! Glad you shared it! Discipline is a very touchy topic, and I admit I’m groping in the dark when it comes to it. We try to follow the Biblical way of parenting, and I would love to know your takeaway from the workshop. This was also a subject of discussion for me and my husband. We were discussing specifically about spanking, and he was in favor of it because Biblical daw. But this article (link below) helped us a lot. It was not specifically tackled in the workshop but I’m convinced that the positive parenting approach is consistent with Biblical principles. My challenge now actually is the follow through – I need to build better habits and gain more patience! It’s really hard to discipline a child. Thanks for sharing about Positive Parenting. All of us will definitely learn a lot from this.